Most of my canvases since the beginning of my painting career have been devoted to views of the landscape, and the relationship between the forest and fresh water. In my current series of acrylic on canvas paintings, I am creating a new body of work that documents the ephemeral beauty of mountain glaciers and streams, referencing photographs that I took during this past summer while visiting the Canadian Rockies. 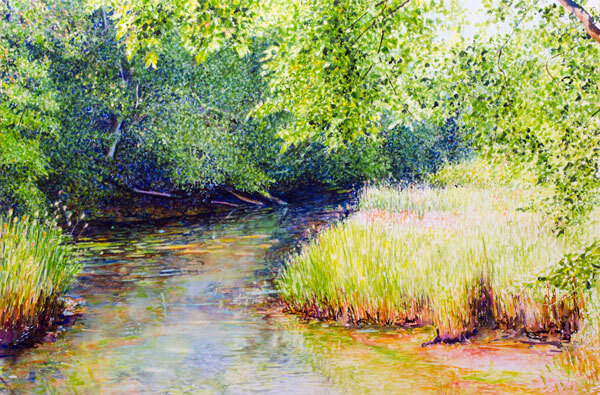 Prior to this most recent work, my paintings focused on the natural sunlit world of the Northeast landscape. 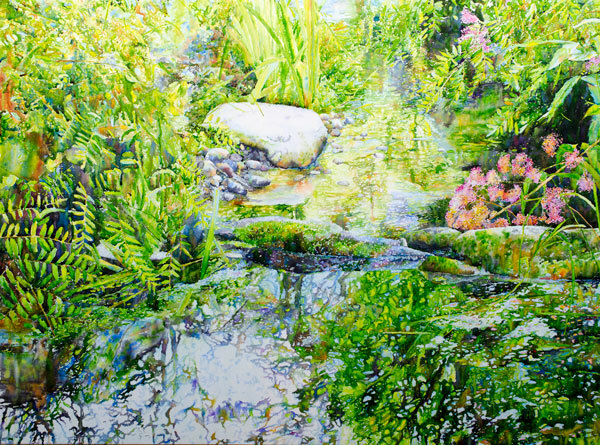 Created in acrylic on canvas and watercolor on paper, they explore visual interaction between streams, ponds and bodies of water with the surrounding landscape environment. Inspired by the interplay and rich diversity of textural elements, form and colors within these natural places, my paintings capture views that range from extreme close-ups, where tiny worlds of subtle harmonies and rhythms are revealed and the recognizable becomes abstract, to more traditional views. Abstraction discovered in the extreme close-up camera view is the primary motivation for my ﬂower paintings. I have always been interested in macro photography and often study nature by photographing it at extreme close range using a macro lens. Attracted to the abstract beauty and unusual colors of the tiny ﬂowers captured in these photographs, I began to intentionally seek out and photograph ﬂowers to be used as subjects. The mounted watercolor paintings on canvas in this show represent my most recent ﬂower paintings, and my continued research into nontraditional methods that enable me to the retain the look of watercolor painting while achieving a painted surface that is comparable in strength to acrylic on canvas. In this way the need to protect the painting by framing it behind glass is eliminated. In these botanically accurate paintings I strive to retain the spontaneity and freshness that is unique to transparent watercolor painting.